The results of ICSE and ISC this year show that Ranchi Loreto has lived up to its tradition of Loreto Education system in decades. Since its inception and foundation, Loreto has always lived its ideals with value based education for development and leadership in forming students to build healthy character. Many of our students who have passed out of this premier School, one of the pioneer schools in imparting knowledge and skills through English medium have proved in life that their Alma Mater, Ranchi Loreto, has contributed globally towards their growth and vision in building new humanity. I am proud to be a part of this Education system and I am hopeful that I will carry out its legacy in the years to come with innovation and in its creative ways. My past experiences working in Loreto schools have been my source of inspiration and in learning ways to help all in a collaborative learning process. Being born in this very City and an Industrial Capital of Jharkhand, my upbringing has been from this great land of Indigenous people, amidst a multi- cultural and multi-religious people. The city has grown enormously during these last few decades after India gained Independence (Aug. 1947). Loreto Ranchi has certainly contributed its magnificent life giving and value based education to our girls to be women leaders in the world today. It’s my great pleasure to be a part of this centre of learning, the Loreto Ranchi for the first time. I have joined this institution since May 1, 2017. I have been actively involved in the Institute of the Blessed Virgin Mary (SOUTH ASIAN PROVINCE) in India, Nepal and Bangladesh. 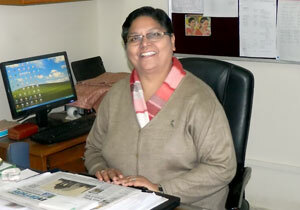 I had the opportunity to serve as principal of Loreto Day School Elliot Road Kolkata, Loreto Intermediate College Lucknow, Loreto Asansol, Loreto Shillong and St Alfred’s High School (Diocese of Barisal), Bangladesh. I am deeply grateful to God Almighty that He has brought me to serve my people through Loreto Convent Ranchi, Jharkhand. The vast years of experiences give me another opportunity to serve this Institution whole heartedly for the greater good and God’s Greater glory. I look forward in co-operation with all concerned to continue this noble mission in the field of education and in collaboration with the Stakeholders of our dedicated Staff and Students. We together may improve on that which is built already through the past endeavours. Our commitment will be for the betterment, common good and for the welfare of this institution and our society at large. I don’t forget our Parents who are our primary teachers and builders of character, our well- wishers and their continuous support, down the ages in all our Loreto Institutions. I seek God’s Blessings to accomplish the dreams I have and the purpose I have been called at this period of history. I love the field of Education and I am passionate about this mission. We have always heard this that the Basic education starts at home and the parents are the first teachers of their children. I would like to quote some of the great personalities of our time. “Education is not preparation for life; education is life itself”. John Dewey. “A child without education, is like a bird without wings.” Tibetan Proverb. “Intelligence plus character - that is the goal of true education” Martin Luther King Jr. I wish God’s Blessing and my very best to each of the students of Loreto Institution, the teaching staff and the other administrative staff in the days to come. I strongly believe that the selfless services I render in life; I receive hundredfold in return. Our Founder Mary Ward says “Do your best and God will help you do the rest.” “Do Good and do it well”. Finally, I would like to end by saying “It’s truly an honour to work for God” That is indeed giving glory to God. I thank Sr. Anjuman, who worked diligently these past three years for the intellectual, emotional, physical and mental development of the children. Our school realizes the important role and contribution of well educated women in society. We believe that every child is empowered to reach her full potential and we provide an atmosphere where the values of love, freedom, sincerity and justice are experienced. Every one of our students should strive for excellence in all walks of life for the greater glory and honour of god. I am happy to be back in Loreto Ranchi. I was here from 2008 to 2009 and took some Maths Classes. The changes which have taken place in three years while I was posted in Kolkata, I attribute to the energy and enterprise of Sr. Marion Vase and the Staff. The additional floor to Asha Kiran wing, the smart class, e-Care facilities (SMS, Online Panel, Website etc) are all new to me. My hope is that we will continue to use these facilities to the full for the all round development of each of you, children, so that you may bring joy to your parents, honor to your School and Glory to God. I have been here sometime now and I must say that I enjoy being in Loreto Ranchi. The first year we put up “the Witness’ which was a superb production in every way, then we had our two great rounds of Sports, Senior and Junior and then this year “Fantasia “ done by the Junior school. In all these events, in which everyone of the girls took part, I saw the talent and the gifts that each one of the students has. Your talents in every field bore good fruit at these productions and numerous other things we staged over the years. Our Christmas projects also have given me life. it was great to see you, the students of Classes 5-12 going out to the various places Shishu Bhawan, the M.C. Convent in Jail Road which houses different kinds of people from 0-80 yrs of age, the Gurunanak Home, the Blind home at Chona ,the blind school at BahuBazar, the old age home at Hesag and the Cheshire home. the effort you have put into communicating with these people, collecting things for them and bringing your vehicles to go to the different places just before Christmas, has been great. It has been my dream to see all the girls here reach their full potential and become the best they could be. The school is there to support you in more ways than one, but you have to do the hard work. All must work hard to fulfill their dreams to reach the impossible star and know who they are. I quote from Marianne Williamson "Our deepest fear is not that we are inadequate. Our deepest fear is that we are powerful beyond measure. It is our light that most frightens us. We ask ourselves, “Who am I to be brilliant, gorgeous, talented, fabulous?” Actually, who are you not to be? You are a child of God. Your playing small does not serve the world. There's nothing enlightened about shrinking so that other people won't feel insecure around you. We are all meant to shine as children do. We were born to make manifest the glory of God that is within us. It's not just in some of us; it's in everyone. And as we let our own light shine, we unconsciously give other people permission to do the same. As we're liberated from our own fear, our presence automatically liberates others." My prayer is that all of us continue to live the Loreto ideals in our lives and see the face of god in all the faces we see each day.